Fall is such a great time of year for design and with the holidays fast approaching, we like to focus on tabletop designs. This arrangement is such a great mix of shapes, textures and color. 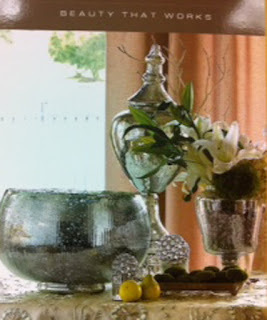 There is just enough sparkle in the glass and silver to offset the natural floral and fruit which add their own pop with color. The splash of green creates an earthy contrast against the metal and glass as well. Varying heights, widths, shapes and size pull together to make a beautiful arrangement.